A Scarf Showing The Amazing Colourway of Lion Brand Unique Yarn. I was playing with a yarn called Unique by Lion Brand. The colour used in the scarf I crocheted was called Garden. Colour transitioning yarns are one of my favourite yarns to work with. The continual transitioning of colours feels like I am crocheting in turbo speed. 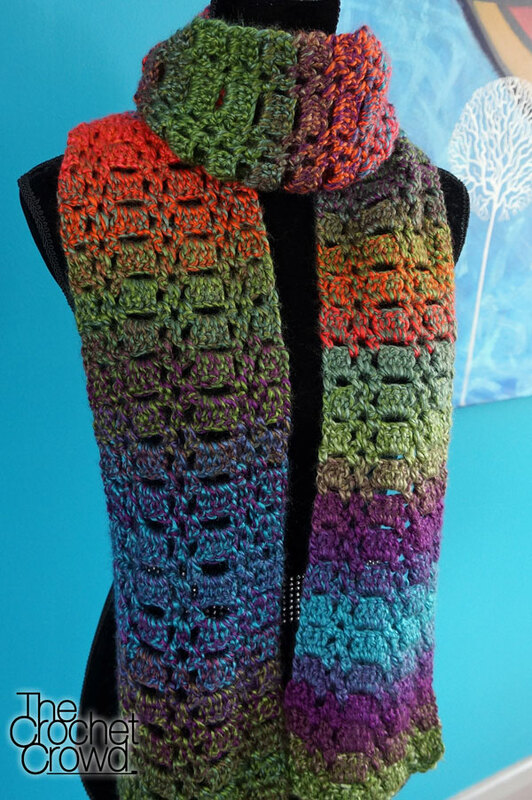 The yarns can turn ordinary stitch scarves into extraordinary finished projects when you are done. The advantage to this brand is the bulky weight to it. Yes… it’s a Level 5 yarn. The yarn is exceptionally soft and hooks up really quickly. I bet you are thinking I used a lot of yarn in this scarf. Psst… I only used two balls for the entire scarf and it wraps around my neck once and has a generous hang to it on both sides. The Amazing Colourway of Lion Brand Unique Yarn. There are 8 different colourways to this yarn. Each are, pardon my pun, ‘Unique’ and fabulous. 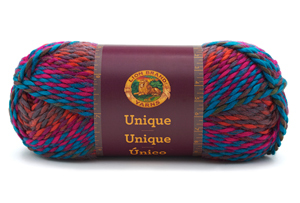 If you would like to play with colours and bulky weight yarn, this yarn may be for you. If you don’t mind, I would love to know where to find this yarn in stores as I got mine online. Please make a comment below telling us where you have seen this yarn in stores. This will help others locate this yarn if they are unable to order online. This entry was posted in Lion Brand Yarns, Yarn and tagged crochet crowd, Lion Brand Yarns, Mikey, Product, Review, Unique, Yarn. Bookmark the permalink. I also would love to have the pattern for that scarf and also which color was used. Please and Thank you for being there for us and also willing to help us. Mikey tour the Best! Thx to Debbie Nicholson at the Crochet Crowd on Facebook, I think we have the pattern ^_^. It looks the same to me.Will have to adjust to size, but thats doesn’t look like it’ll be a problem. I am going yo have to move somewhere, where they have a variety of yarn. There is not much to pick from here in amarillo tx. I’ve purchased this yarn at JoAnn’s. Love the yarn and would love the pattern for the scarf you show. It’s just beautiful. I too saw it at JoAnns in Stockton CA I would LOVE the pattern also. Could you post the pattern please? Only the first scarf (red heart pattern) is there. Thanks! I am a beginner crocheter and I picked this yarn for my first project because it is so beautiful. My friend, a vet crocketer told me she couldnt work with it. But I found it to move fast! I found mine at my local Walmart. Love your scarf! The first item of the newsletter gives the details of the pattern folks. I bought some at Michael’s in Maryland. I made an infinity scarf and it was GORGEOUS! It was purple tones. The texture is awesome too. SO easy to work with. Beautiful! I would love the pattern as well…..
Love the colors. Is it a Red Heart pattern. I got mine at JoAnns. I’ve made 3 cowls, 2 scarves and 2 raunas from this yarn. I love, love it. A.C. Moore’s has this yarn for $5.99. I made a cowl using this yarn. It is beautiful! My designers and I have loved working with this. Fab colors and a wonderful hand! We’ll have some pieces on the runway at the Manchester CGOA fashion show. Michael’s is carrying this now in the US. I saw some last week. This is gorgeous, Mikey. I, too, would like to know what pattern you used. Mikey, I saw it at Joann’s just yesterday. It was gorgeous!!!! I bought 2 skeins and might make a scarf for myself (!!) with it. I also have a Lion Brand store near me and they have all of the colorways (my wallet is in danger). I seen the yarn at pat Catan’ s craft stores…I would imagine Joann’ s have it..
Mikey, I received three skeins of this brand and the colorway “garden” just yesterday from a good friend. I wasn’t sure what to whip up with it, but now I do! I love the scarf you created! Do you have a pattern for it or what is the stitch you used? I was thinking about doing the broomstick lace stitch in a cowl. I found the brand and colors online and not sure where to find it in stores. The yarn is beautiful! By the way, Mikey, what pattern did you use for the scarf? Is it a Red Heart pattern? Thank you! !